The suite of general-purpose programs that come standard on most computers includes word-processing, spreadsheets, presentations, and drawing. These can be useful for Six Sigma purposes and generally come standard on any laptop or desktop. First marketed by Microsoft under the Office brand, people often substitute Microsoft’s product names for the general-purpose tools. But different providers offer different tools. Although the providers are competitors, most of these products fully read and interact with the complimentary product from the other providers. You regularly use computer-based document programs like Word in Six Sigma for defining projects and writing business cases, reports, and problem and objective statements. Most organizations create reference templates or have libraries of past examples for you to use to help ensure consistency and comprehensiveness. Spreadsheet data files can be easily stored and shared and, like with documents, you can create templates and example references. Note, however, that spreadsheets have limitations. Spreadsheet data are stored in what’s called flat files — a simple file structure that’s just rows and columns. But real-world data usually are related in multiple ways; the standard for defining relational data is the Structured Query Language (SQL), the construct governing database systems such as Oracle and Sybase. Accessing data from SQL databases into flat-file spreadsheets involves precision extract procedures and mapping algorithms that are typically outside the realm of most casual spreadsheet users. You’ll need technical assistance. Six Sigma managers make full use of presentation packages like PowerPoint as a communications tool. Many people inappropriately utilize presentation software as a process mapping tool. Yes, you can draw boxes, circles, and arrows in PowerPoint, but that’s just drawing, and it suffers from most of the same drawbacks as doing it by hand. Instead, use presentation tools for the appropriate purpose of communicating with the people you’re working with. 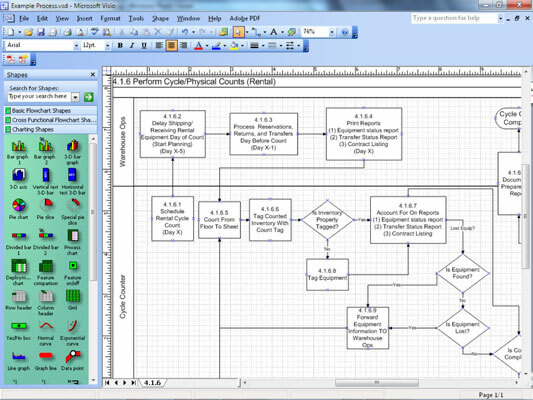 Microsoft Visio has been included as a standard desktop computer program on PC desktops and laptops for many years. It also runs in the Mac environment. As such, most Six Sigma practitioners use it to draw process maps and flow diagrams, and most instructors teach process mapping with it. Microsoft has built an array of flowcharting icons and tools into Visio that makes drawing process maps easy. You can also set process steps into swim lanes and draw the flows horizontally or vertically. Numerous add-ons and third-party extensions are also available that provide even more functionality and capabilities. Many of these extend the drawing and mapping features, while others let you import and export data with external data sources. The most important options for Six Sigma practitioners are the extensions that elevate Visio from a simple drawing tool to a more enterprise-compatible process mapping tool through BPMN: the ability to export the process description to process execution engines. Without this enhancement, Visio is just a drawing tool.